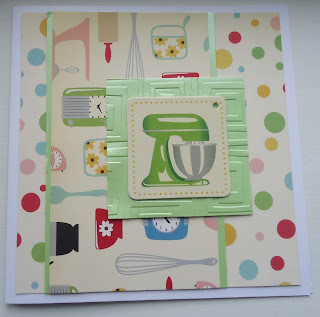 I love the retro kitchen look and I’ve kept it simple here using a sketch from Pink Gem Challenge . The papers are by October Afternoon, the chipboard mixer is a magazine freebie and I used an embossing folder (Cuttlebug?). 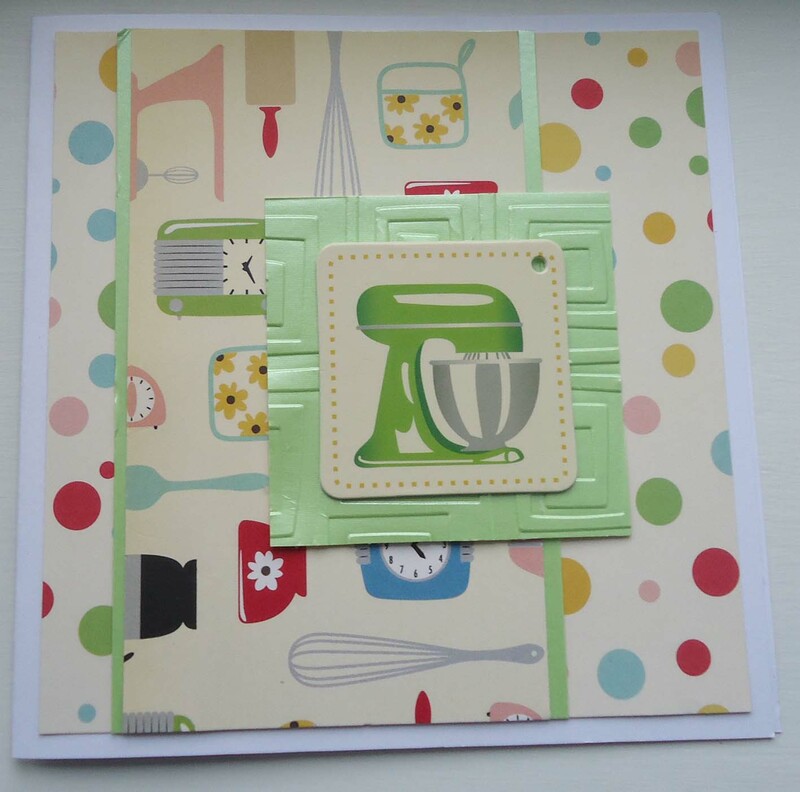 I'd also like to enter this into the Kitchenalia challenge at Daring Cardmakers . 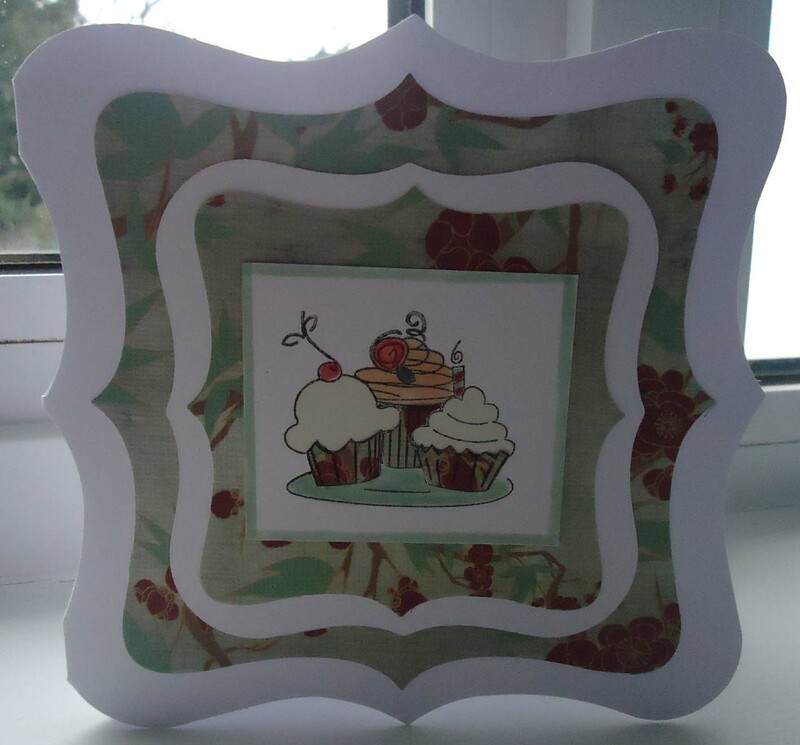 Gone crazy with the fancy frame die-cutters! 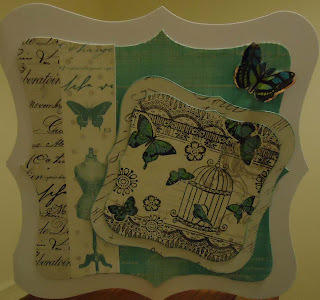 I love this patterned paper from a Die Cuts with a View paper stack. I've been able to join in some great challenges with this card : Gingersnap Creation's Favourite Designer Paper, Fashionable Challenges' Butterflies or Bugs, and Moving Along with the Times' Things with wings. The stamp is by Crafty Individuals and the patterned paper is from Parisian Anthology by Pink Paislee. I used four different scraps of the paper, including one that was white embossed and I inked. ( Background, right side!) Other things I used were Promarkers and a butterfly sticker. 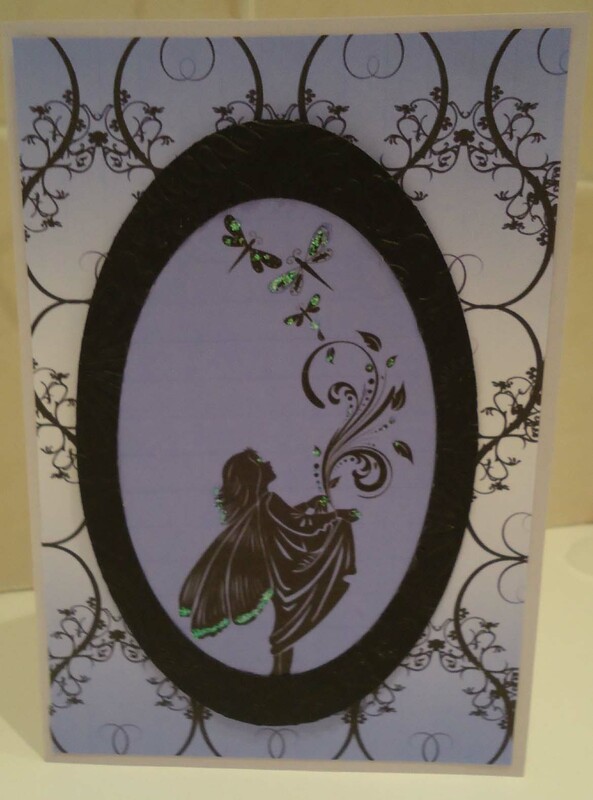 I cobbled the central image from My Craft Studio 'Simply Silhouettes' and 'Flourishes' CDs. I die cut and embossed black card for the frame. The background is MCS again and I dotted it with Holgraphic Stickles. I wanted to make a card for Less is More's Birds challenge as it has to be a one layer card. I find one layer cards excitingly scary as, if you make a mistake, you can't just slap something on. I used Glimmer Mist to make a sun and a Crafty Individuals seagull. Crafty Ann's Let's think hot. Pencil Lines has a great sketch this week, perfect for scrapping the Christmas photos. I love this photo of my son. The letters are by Anna Griffin. Not sure who made the papers as I cut off the strip and threw it away! This is a combination of two challenges I really wanted to enter - Vintage Boudoir at the Shabby Tearoom and Candelabras, Chandeliers and Candles, at Gingersnap Creations. Despite making it specifically for these challenges, I'm not sure I did that great a job in fitting the brief for The Shabby Tearoom. I think (hope) I captured the essence of the photo inspiration but you were supposed to include a sewing embellishment. I have several stamps and die cuts of sewing machines, scissors, tape measures etc, but none looked right. However, lace is listed as a sewing embellishment, and I have included that, so hopefully I won't be disqualified! The flapper was taken from a big BLine stamp. ( I used the full stamp here.) 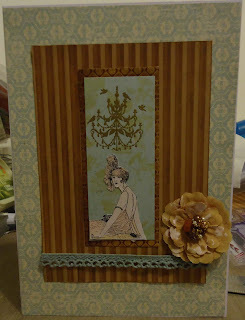 The chandelier was a Craft Stamper Magazine freebie. 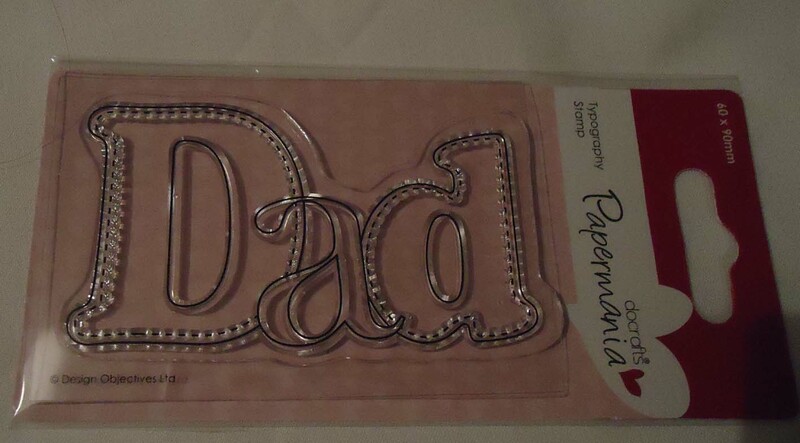 I love it, but it's very small, so difficult to use on its own, except for small gift tag etc. I really should have tidied my desk before taking this photo! Despite cropping the shot, you can still spot an old margarine tub lid at the side. Let me reassure you that I haven't been making sandwiches while crafting; I've just using it as a palette! 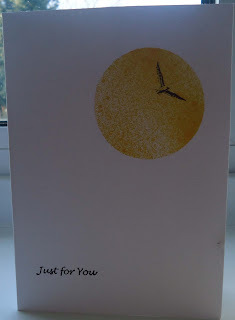 This is the first time I’ve used this digital stamp from A Day for Daisies and the idea for the colour palette came from Gingersnap Creation’s challenge “Soft Yellows and White”. I paper pieced the chair using some leftover Basic Grey ‘Lilykate’ paper. I coloured the rest of the image using Promarkers. I edged three strips of the paper with ‘Buttercup’ Promarker. I used a notch punch on the corners of the central image and threaded yellow thread to make a frame. Doing the Docrafts - Hot Diggity...mouse??? 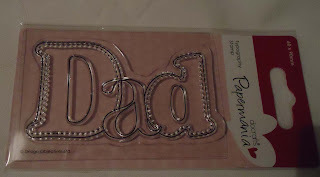 And on with my self-imposed challenge to use every item in the new Docrafts Goody Bag. This mouse on cake image is from a decoupage sheet called 'Hot Diggety Dog'. I'm sure there's some kind of story to these characters, as plainly, this one isn't a dog. Is it hot? Is it diggety? I don't know! 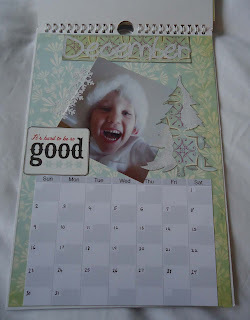 Last Sunday I set myself the challenge of using every item in the Docrafts Goody Bag. I used the first three items here. For this card I used the paper pack again. The rubber stamp saying ‘Thank You’ has a matching die. The girl is a digi – stamp by Heather Ellis that I bought especially for this project. She was sitting on something but I cut it away so she could sit on my ‘thank you’ , coloured her in and paper-pieced the dress. 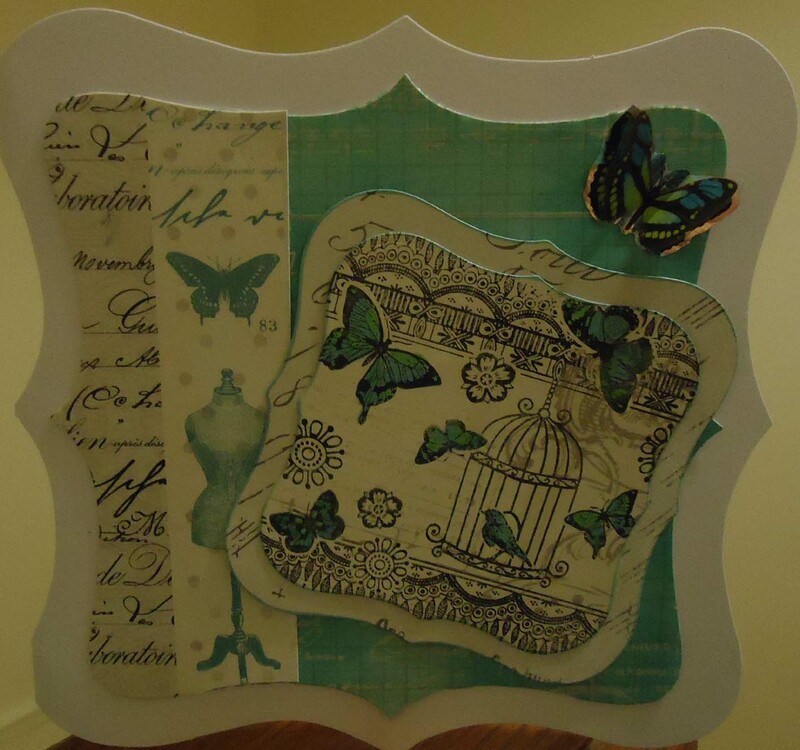 The bigger bird stamp is Kaisercraft ,paper pieced again. I stuck the girl and bird on with 3d foam pads from the goody bag. So, as well as the paper pack I’d used previously, I used another two items from the goody bag – that’s 5 in total now, so nearly half way. I wanted to make a New Year/ Thanks for my presents card and The Shabby Tearoom Time Flies challenge and photo gave me some ideas. The ice skater is a very old um stamp and I gave her a big watch to hold (old Craft Stamper Magazine freebie) and gave the watch wings (Non-sequitur) . 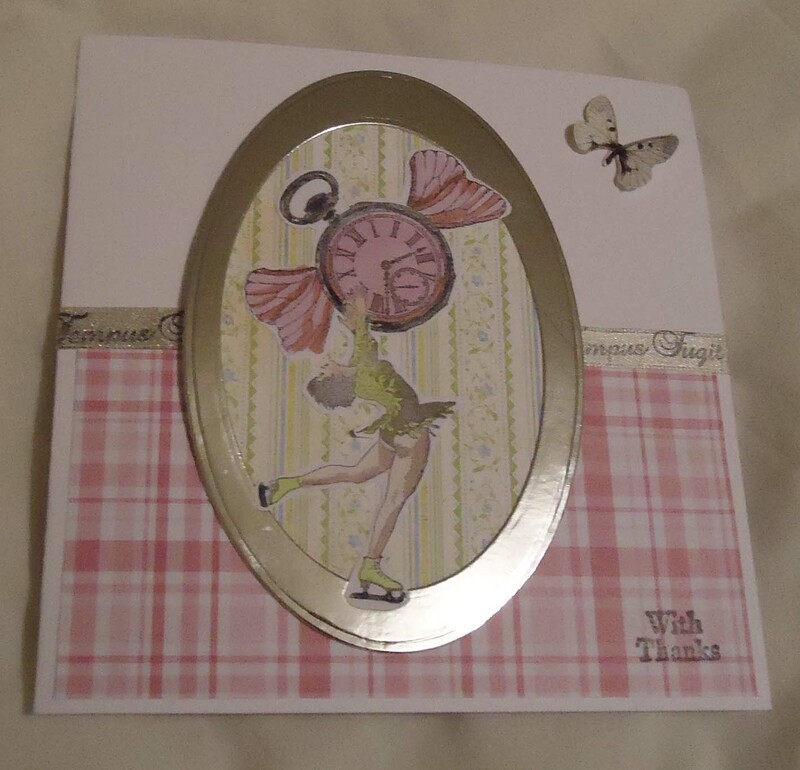 I used the colours pink and green , inspired by the Shabby Tearoom photo and added an oval of silver card for the skater’s ice. 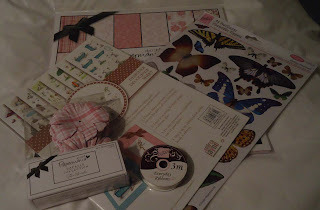 On Sunday I set myself the challenge of using all the products in my new Docrafts Goody Bag. 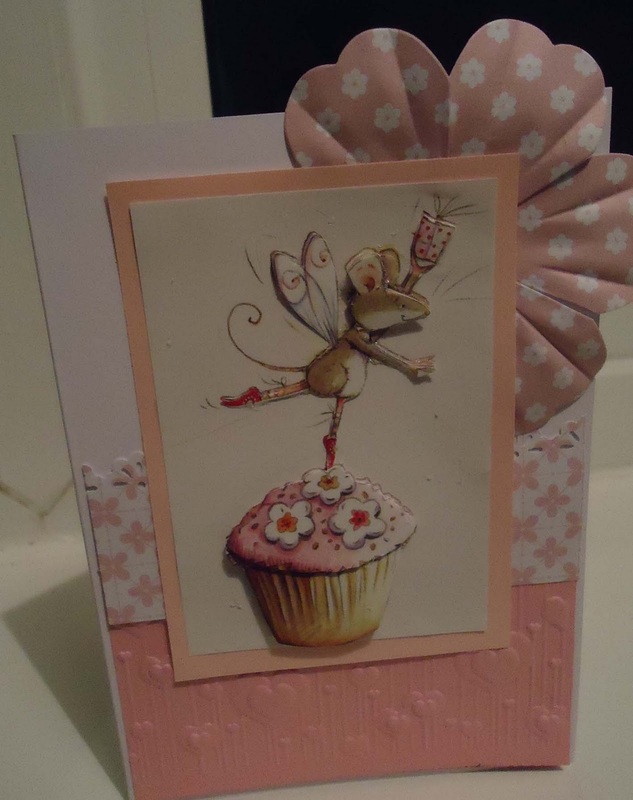 I’ve used 3 out of the 11 on this card – pink check paper, butterfly (edged in green) and ribbon. 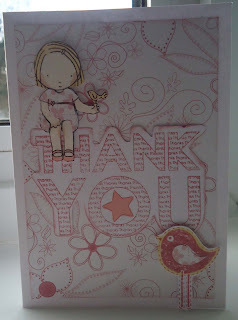 I stamped the ribbon with Tempus Fugit – also from the Craft Stamper freebie. Deep and meaningful comment - The skater represents me skating from winter towards spring, while trying to stop time flying away!!! 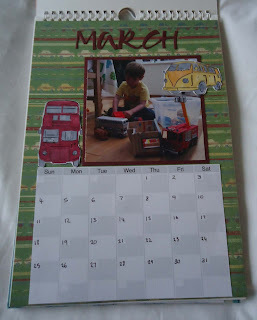 Papertake Weekly Challenge - Anything goes with the option of a 'new' theme. 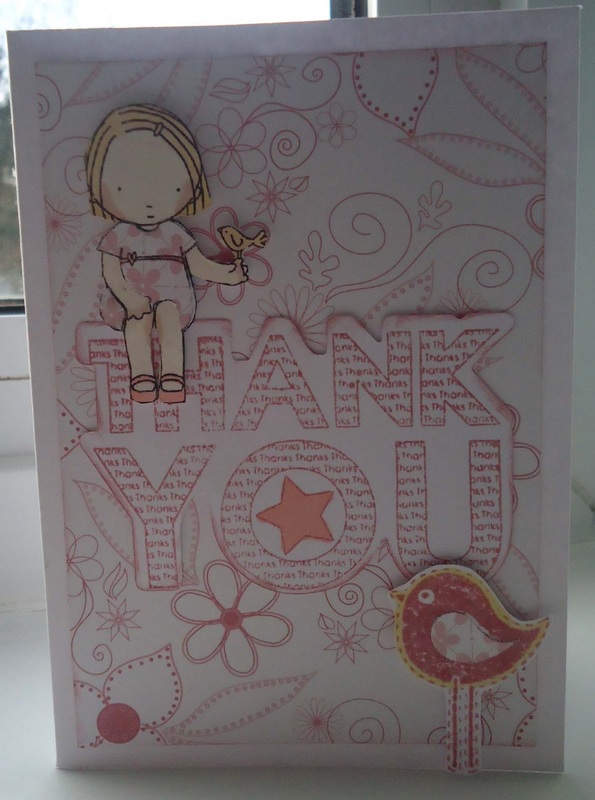 Clear it out Challenge Thank you card, use up your twine or ribbon. Well, this is absolutely my last Christmas themed project for a while! This is my favourite page from the calendar I made for my mother-outlaw. 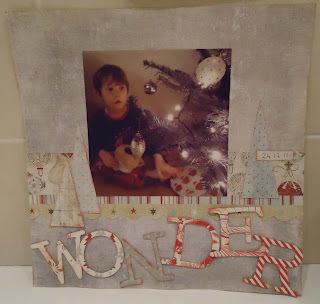 I used Cosmo Cricket 'Mitten Weather' kit , a Sizzix Christmas tree die, Martha Stewart snowflake border punch and glitter paper. Yes, I've got it already, with lightning fast delivery from Mad about Cards. These are the things I immediately thought -yes, I can use those. 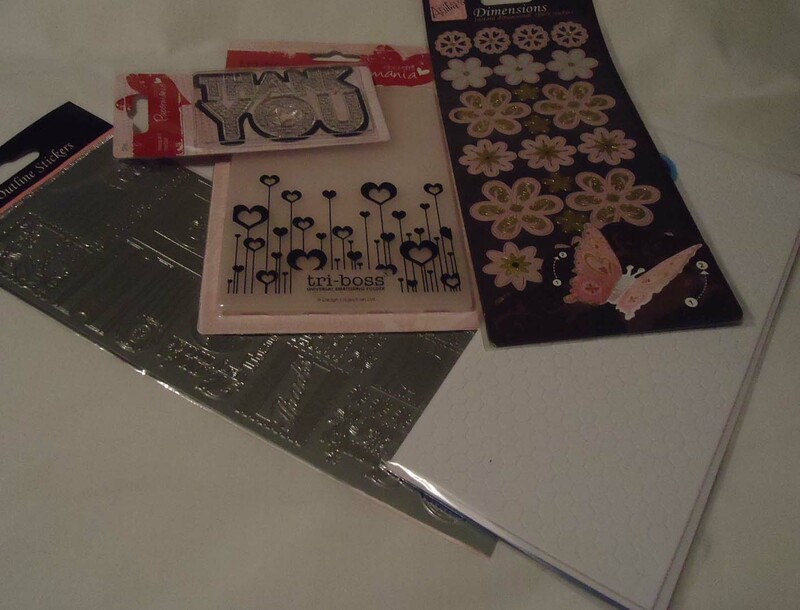 There's 'thank you' stickers and a stamp; an embossing folder;dimensional flower stickers and foam pads. Then there's the stuff that I wouldn't have immediately chosen for myself but would like to try. The pinky colour of the paper wouldn't have been my first choice, but the flowers look good. I'm not big on decoupage - or dogs- but will give the Hot Diggety Dog stuff a try. I rarely use ribbon (gasp!) and, although I like butterfly motifs, those ones seem big for a card. Yes, unfortunately my own dad is dead. My son, who is nearly five, might like to use it though, although fathers day and his dad's birthday are a long way off. So, once again I'll be challenging the My Perfect Life Design Team (still just me, I'm afraid) to use up everything in the Goody Bag. Check back later to see how I do! Happy New Year to everyone who stumbles upon this page and especially to my tiny, exclusive group of followers ( thank you so much for your kindness!!) . Docrafts have brought out a new range of 'British' themed stuff and I bought a stamp set called Papermania Portobello Road. 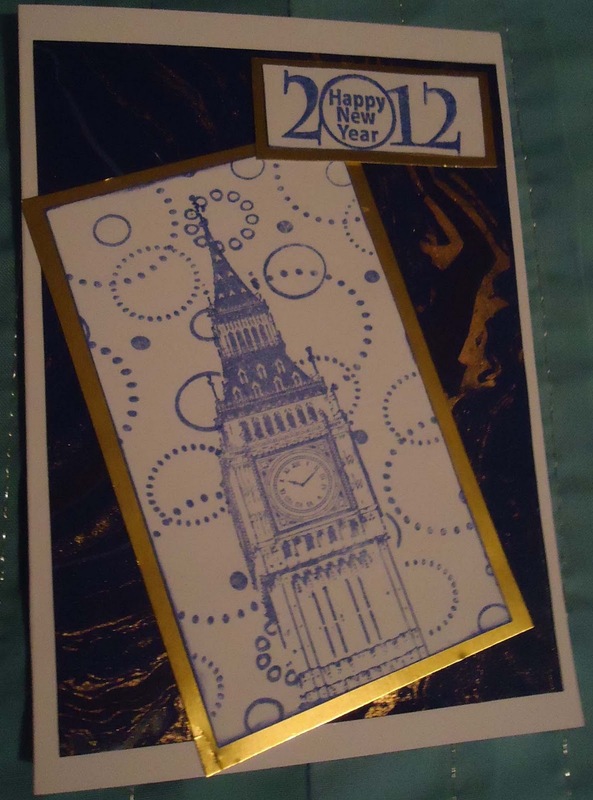 I thought the Big Ben stamp would be good for New Years cards.Unfortunately the clock hands aren't pointing to midnight. However, in the UK Big Ben is so much an icon for New Year, I hope that that this will be overlooked! I masked off Big Ben and stamped Fiskars circles to be reminiscent of fireworks. Here are a couple of other stamps - a bus and a camper van - from the same stamp set, used on a calendar I made for my mother - outlaw. They came over for New Years Eve and when I gave it to her the glue was still wet!